Do you suffer from fibromyalgia and have you noticed that this has improved because of the MIR-Method, or has it even disappeared altogether? That’s great! I have been using the Mir Method for about 3 weeks. I read a previous comment from someone who was feeling worse than they felt when they started and this also is happening to me. I have pain in my neck, shoulders and back that travels around. I’m also experiencing heartburn and stomach aches, and a ringing in my ears. I’m not willing to give up yet, but am think of visiting my doctor if these issues persist. Thank you. It is always a good idea if the complaints persist to go and see a doctor. What usually helps a lot is to drink water or milk. Your body is working hard to throw out toxicity and if the toxic stuff cannot leave your body, you may get headaches, pain in neck or shoulder or muscle pains. So please drink enough water when doing the MIR-Method! Thank you! I did the MIR-Method for five weeks, consequently. Forgot 1 time. Without my realizing it, I started to sleep longer and also more deeply. In addition, my intestines are being so well cleansed that the toilet can’t deal with it all (to put it nicely). Although it wasn’t necessary, I’ve lost 4 ½ pounds in the first four weeks and I think this has now stabilized. I don’t notice many physical changes but it is wonderful that the waste materials are being disposed of. Who knows, maybe more will change. I’m going to continue doing it twice a day. Am curious about how it will further help me. I also went to a naturopath and she examined me using bio-resonance measurement and it turns out that my body is completely acidic and suffers from a shortage of various vitamins. My vitamins were 23 instead of 75/100. I had this tested by my primary care physician. I’m now using expensive vitamins in the hope of supplementing all shortages and I try to eat in such as way as to detoxify my body. I’ve been doing the MIR-Method for 10 weeks now. And noticed direct results right from the start. My bowel movements improved and I noticed that my body was cleansing itself. I did find it difficult to deal with my, once again, much stronger emotions. But that has calmed down during the past weeks. Now I’m noticing that all my problems from the past are coming back again. Pain that had been gone for years has come back in full force. The old ones remain. Muscle tension is worse than ever, and I feel it everywhere. It wanders around my body but it never leaves and only gets worse. Worsening pain and old complaints sometimes return. A sign that your body is hard at work. It’s difficult for you, but it is a good sign. I read that you were doing really well at first; now your body is ready to allow the old emotions to surface, as well as the old pain. This can be the result of something that happened in the past, maybe something you’ve forgotten about, but that is still blocking your system. My advice is to have a coach test you; there must be one in your neighborhood, you can search here . I hope that it clears up soon! I do the steps faithfully and the 3 months just go by quickly. Invest in yourself; for the people who are still a little skeptical, just try it. It really works! Wishing you much love and health. Namasté. I went through 4 weeks of the 9-step MIR-Method. It’s wonderful; my pain has lessened by about 80%. The horrific pain in my hand is almost gone; there is some wear and tear which I still feel but it is manageable. Have a lot more energy and I’ve noticed that I feel freer to express myself without worrying what the other person thinks about it. What a huge gain this is. Am so grateful. I will continue for a while because I’ve had problems for a long time bas the result of a traumatic past for which I had EMDR (Eye Movement Desensitization and Reprocessing) treatment. This treatment stirred up so much that many problems ensued. I am a happy and thankful person. With thanks to Mireille for the wonderful steps. Once again, thanks. Did the MIR-Method for 4 weeks a while ago! I’ve got, among other things, Fibromyalgia. Sometimes I still do it, only then not 4 weeks in a row! I sleep better. My bowel movements were always dramatic; I sometimes used an enema and should be using a stoma, but want to postpone that for as long as possible! After doing the MIR-Method, my bowel movements occur more spontaneously and are easier; this after 5 years of messing around about whether or not to use a stoma, I am very happy about this! I am very happy for you! How wonderful that you have been able to prevent getting a stoma! This must give hope to a lot of other people. Thank you for writing this message! Wishing you much success and I’d love to hear from you again! Thank you for your lovely reaction. I’ve decided to do the full MIR-Method again; I’m just going on with it. My feeling is that I should continue with it, so that’s what I’m going to do! My Fibromyalgia is as good as gone now, knock on wood! 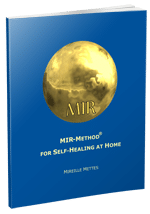 Hi Mireille, I just wanted to let you know that the MIR-Method has meant a lot to me. I’ve been familiar with the method for about 2 years now and repeat it once in a while for 4 weeks. During this period, I became a vegetarian. I started shortly after that with organic food and I completely stopped using soda and products with various additives. Then, I came across detoxification and now take this into consideration. My Fibromyalgia symptoms have more or less disappeared and I’ve made good choices which suit who I am. Grateful for your wonderful and easy method!! I’m going to continue to see if I can stop smoking. I’m so glad to hear this! It must be wonderful to live without all these problems! I am thankful that you were willing to write about this, because by doing so, you give hope to a lot of other people with Fibromyalgia. Thank you for this! I wish you success, also to stop smoking. Allow yourself time for this. Have you already seen the video about addiction? Today is the second day and have placed the notebook where it is visible so I won’t forget it. Have had various diagnoses from doctors/psychologists, including CVS (Cyclic Vomiting Syndrome), Fibromyalgia and borderline. The MIR-Method has especially helped me to feel more comfortable with myself, lighter and happier inside; that alone makes it worth doing and that’s why I’m starting again…and now with the intention to do it for the full 4 weeks. Success and thanks for this, Mireille. I wish you incredible success with this and it’s fantastic that you are trying to be disciplined about it; super! It tells me, in any case, that you feel you are worth persevering for; super! Let me know what else you notice about it, ok? Hearty greetings and much success! These kinds of problems take time. Many chronic illnesses need at least 4 months and the MIR-Method does continue to work for 19 months. I would suggest that you continue to do the MIR-Method for a while. Good luck and feel free to ask again if you have doubts. I’ve been doing the MIR-Method for a week now and I feel good. I have Fibromyalgia and because of it, all kinds of problems. I can share that I’m sleeping better and I even cleaned my son’s bedroom yesterday (my husband does the housekeeping) and have not had any negative results from it today. Fantastic, I also do the extra affirmation because of my addiction to smoking. I have been doing it now for 3 weeks. From the beginning I felt warmth, after that a lighter feeling as if I had lost weight (I stopped smoking a year ago and gained 10 kg.). My blood pressure has been too high for 2 years and the physician wants me to take medication, but I use only medication when it is absolutely necessary. I have noticed an increased amount of stools in the last 2 weeks, whereas it was quite normal before that. I saw it as if I was ‘letting go’. Since last week my children have noticed that I can walk for longer than my usual 10 minutes. Years ago doctors measured the acidity in my legs as the equivalent as if I had run the New York marathon. Cause Fibromyalgia. I sleep a little better now and can concentrate a bit more. For the past 30 years I have slept only 2-3 hours per night. I always go to bed late and get up early in the morning, just because I like waking up and I’m not bothered by the lack of sleep, but these past weeks I have slept sometimes for 5 hours in a night and that is quite something. I do the MIR 2x a day, in the morning and before going to bed. I enjoy doing it very much. I think I will continue for more than 4 weeks for my physical complaints.